If you like, you can prepare the pie crust in advance. You can either use a pre-bought pie crust or pastry dough instead of making your own shortbread pie crust, but I personally love the shortbread crust better with this pie. Blend the flour, sugar, and butter together with a food processor or hand blender. When it’s ready, the mixer should look like breadcrumbs. While processing (or mixing), slowly add a tablespoon of iced water at a time until the mixture is a smooth dough. Knead the dough lightly by hand a few times (don’t overknead), wrap it in plastic wrap, and put it in the fridge for 30 minutes. After 30 minutes are up, preheat the oven to 350°F. Roll out the pastry onto a nonstick baking paper into a thin sheet, about 3mm thick (or as thick as you like it). Transfer the paper and pastry over to a 10″ pie pan, trim the edges, and weight down the crust with baking weights or rice. Bake for 10 minutes. Remove the weights or rice, and bake until the crust is golden. In a medium pot, mix together the sugar and cornstarch. Slowly stir in water, making sure the cornstarch is thoroughly mixed through. Add the blended strawberries and put the mixture on medium heat to cook. Stir constantly until the mixture thickens and bubbles. Take it off the heat. Allow it to cool to room temperature. Chill the pie for 2-3 hours. Whip the whipping cream until stiff and generously spread it over the top of the pie, covering the strawberries. Serve immediately or as soon as possible, or chill until serving time. 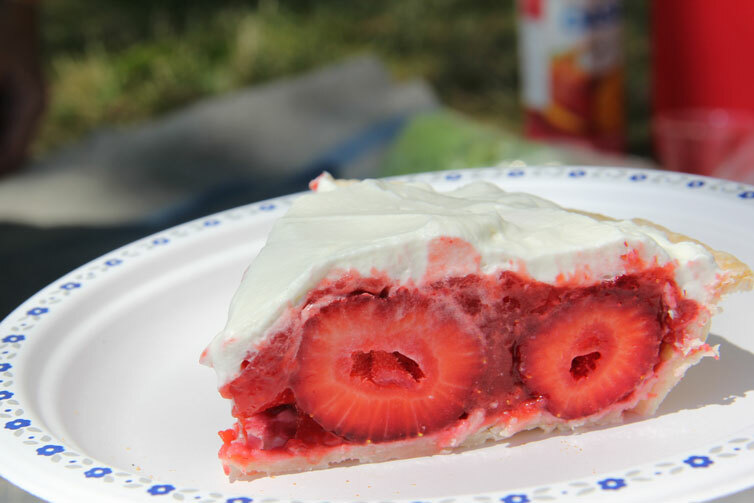 This entry was posted in Desserts and tagged dessert, fresh, pie, strawberry, summer. Bookmark the permalink.